[S80] Ireland, Births and Baptisms, 1620 - 1911, online \, Birth of George Henry Shire, son of John Henry Shire and Isabella Miller; FHL Film # 255898. [S80] Ireland, Births and Baptisms, 1620 - 1911, online \, Birth of George Henry Shire, son of John Henry Shire and Isabella Miller on Jan 22, 1874; FHL Film # 255898. 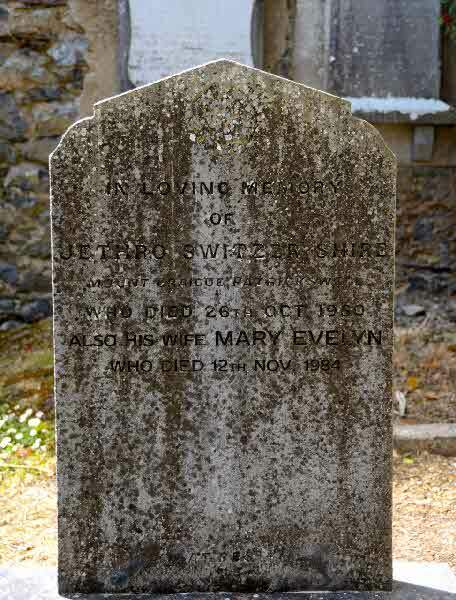 Marriage* Gertrude Maud Mary Shire married John Switzer, son of Martha Shine, on 3 February 1926 in Adare Methodist Church, County Limerick, Ireland. 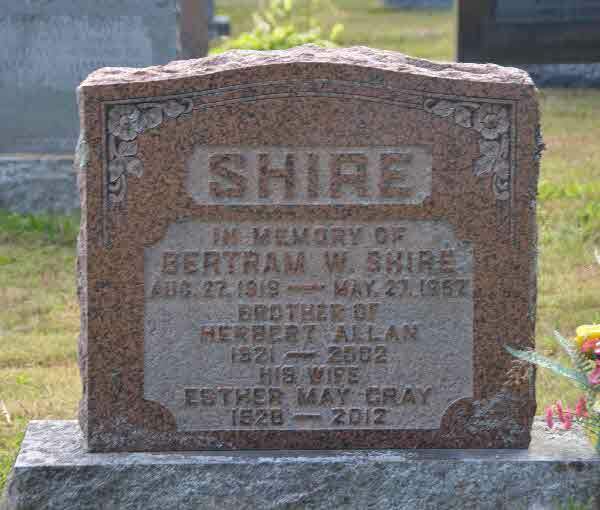 Burial* He was buried in St. Thomas Anglican Church Cemetery, Bracebridge, District of Muskoka, Ontario, Canada. 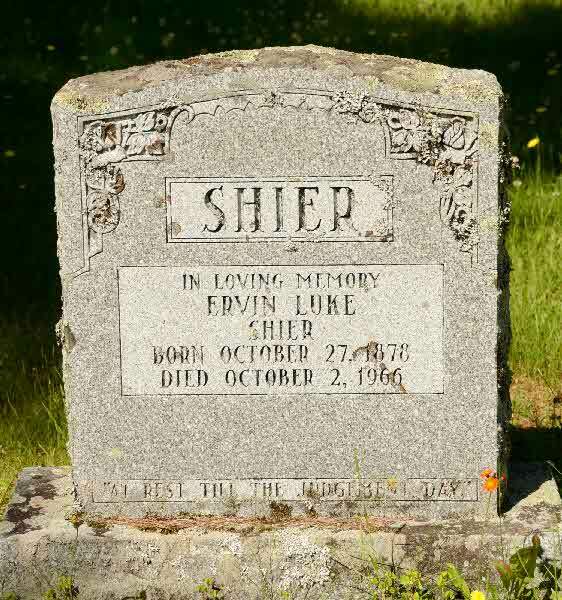 Burial* He was buried in St Thomas Anglican Church Cemetery, Bracebridge, District of Muskoka, Ontario, Canada. [S35] Ontario, Canada, Marriages 1801 - 1928-1934, unknown repository, unknown repository address. [S73] Ireland, Select Births and Baptisms, 1620 - 1911, online \, Baptism for Hugh Shire. (Witness) Census James Shire appeared on the census of 1870 in the household of Nicholas Shire in Braceville Twp., Grundy County, Illinois, United States. (Witness) Census James Shire appeared on the census of 12 June 1880 in the household of Nicholas Shire in Braceville Twp., Grundy County, Illinois, United States. [S71] Familysearch.org, online \, Mentioned in the death registration of James Shire. 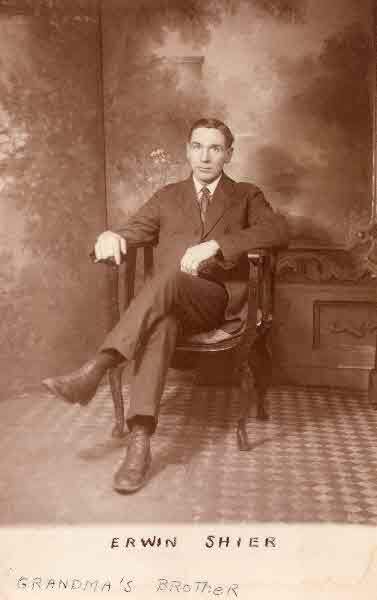 Birth* James Herbert Shire was born on 15 March 1895 in South Crosby Twp., Leeds County, Ontario, Canada. 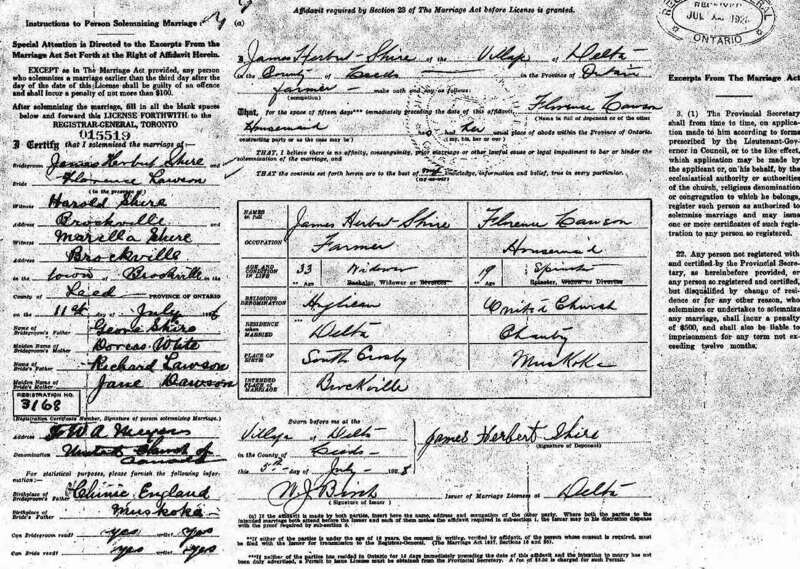 Marriage* James Herbert Shire married Florence Lawson on 11 July 1928 in Brockville, Leeds County, Ontario, Canada. [S82] Wikitree, online \, Sean Terrell (Descendant) and Pam Hendrix, Wikitree. 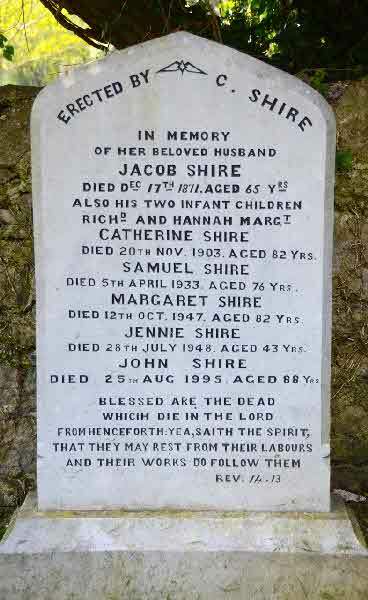 Marriage* Jane Shire married Richard Whitaker, son of William Whitaker, on 2 October 1876 in Killeedy, County Limerick, Munster, Ireland. 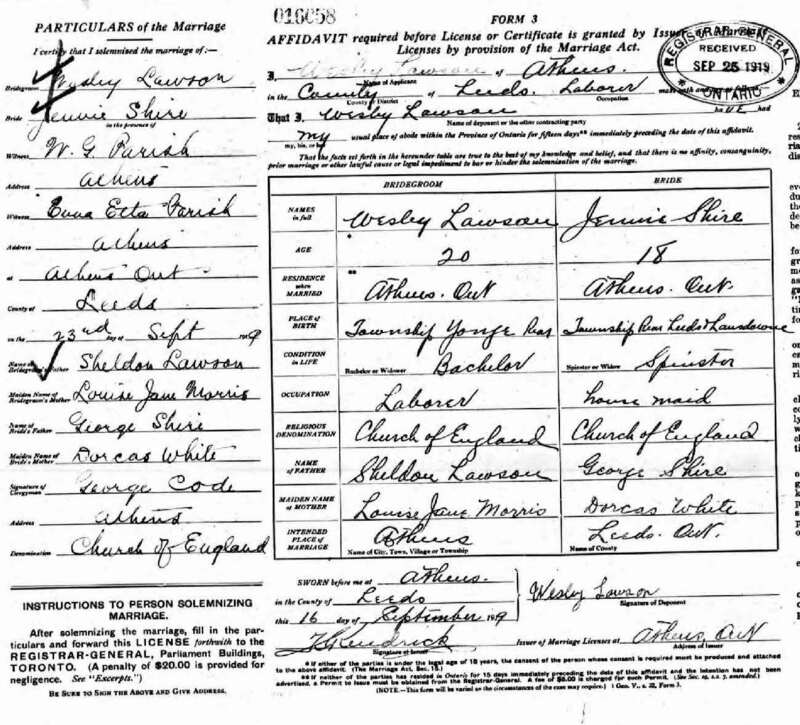 Marriage* Jennie Shire married Wesley Lawson on 23 September 1919 in Athans, Leeds County, Ontario, Canada. Burial* He was buried in St Nicholas Church Cemetery, Adare, County Limerick, Ireland. 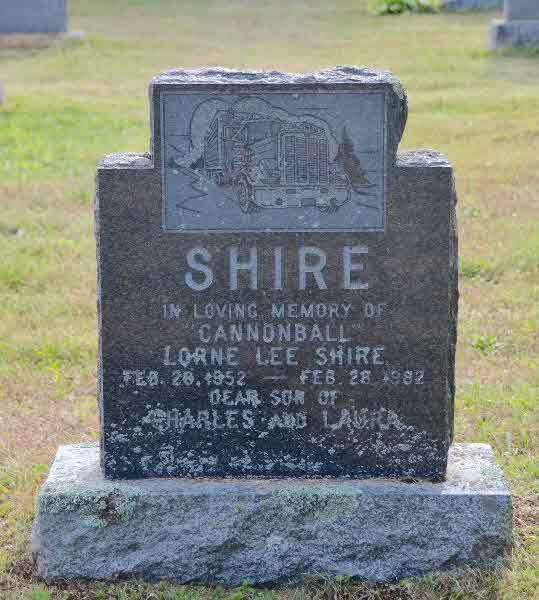 (Witness) Census John Shire appeared on the census of 1870 in the household of Nicholas Shire in Braceville Twp., Grundy County, Illinois, United States. (Witness) Census John Shire appeared on the census of 12 June 1880 in the household of Nicholas Shire in Braceville Twp., Grundy County, Illinois, United States. 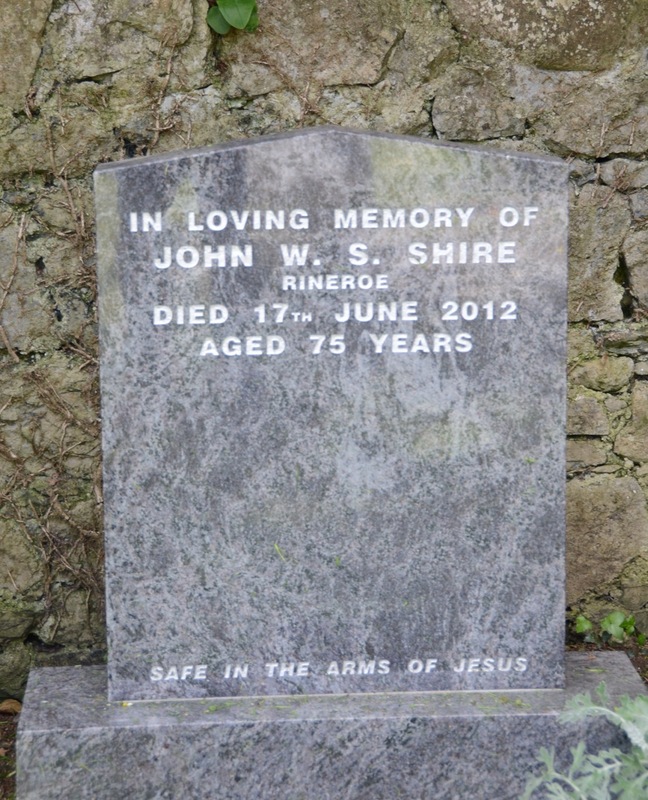 [S74] Ireland, Civil Registration Deaths Index, 1864 - 1958, online \, Death Registration of John Henry Shire; born about 1846, died 1875, Rathkeale. Burial* He was buried in Church of St. Nicholas Cemetery, Adare, County Limerick, Ireland. [S73] Ireland, Select Births and Baptisms, 1620 - 1911, online \, Birth of John Switzer Shire, son of John Henry Shire and Bella Jane Millar; FHL Film # 101219. (Witness) Census Kate Shire appeared on the census of 1870 in the household of Nicholas Shire in Braceville Twp., Grundy County, Illinois, United States. Marriage* Lillian Louisa Shire married Archie MacFarlane on 30 September 1914 in County of Dublin, Ireland. [S110] Ireland, Civil Registration Births Index, 1864 - 1958, online \, Birth Registration for Loftus Thomas Shire in the 1st quarter of 1898; FHL Film Number 101067. [S33] Interview with unknown informant (unknown informant address). 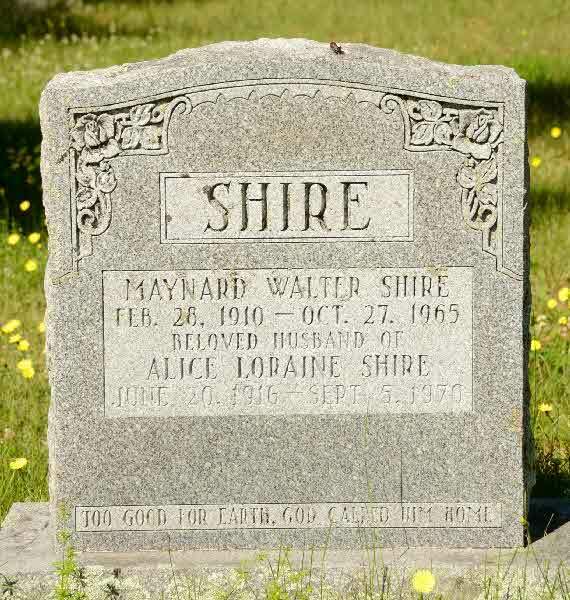 Unknown repository (unknown repository address), Shier History Book; descendent of Martin Shier of Adare. 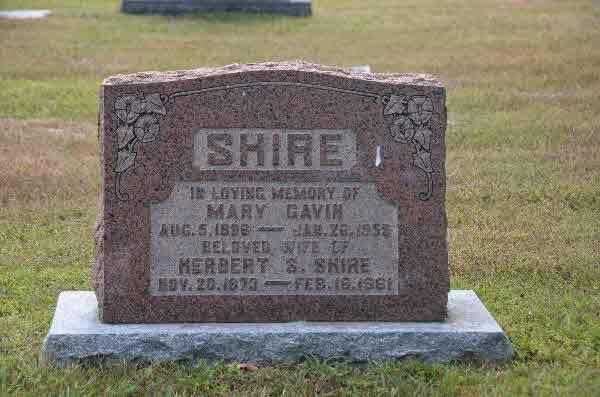 (Witness) Census Martin Shire appeared on the census of 12 June 1880 in the household of Nicholas Shire in Braceville Twp., Grundy County, Illinois, United States. (Witness) Census Mary Ann Shire appeared on the census of 1870 in the household of Nicholas Shire in Braceville Twp., Grundy County, Illinois, United States.